This pattern is only for free personal use. You are not allowed to translate, sell or distribute this pattern without my permission, please send a direct link to whoever wants to share this pattern. You are free to sell your finished product, but please credit the original designer when appropriate. I used acrylic and cotton yarn to test the pattern. You can choose your favorite colors. 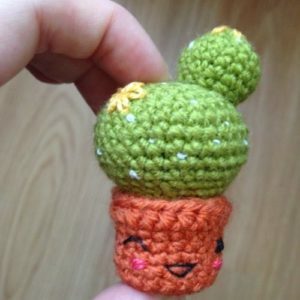 Yarn in two colors for the pot and the cactus (I used acrilic yarn for needles 3). Black and rose thread to embroider the face. Yarn needle for sewing parts. Sewing needle for embroider the face. 9. 21 hdc, 1 sl st.
Cut the yarn, but leave long tail for sewing. Stuff it. Sew the big ball with the flower pot in the 10th round of the pot. Sew the small ball over the big ball as if it were a topknot. Embroider eyes and mouth with black thread. The blushes with the pink thread. Embroider the “thorns” using the French knot stitch with the white thread. Embroider the flowers using the lazy daisy stitch. Congratulations! 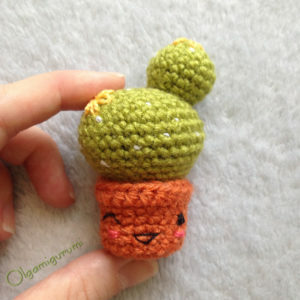 Your Grandma-cactus is ready! 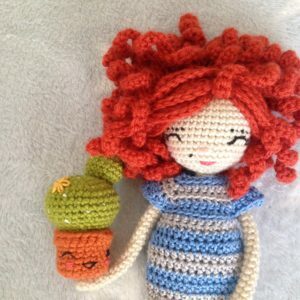 Use your fantasy, your favorite yarn and hook! Previous Post: Sleepy mouse. 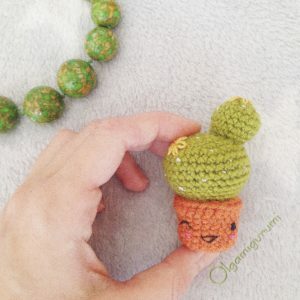 Free amigurumi pattern. Next Post: A beautiful crochet flower. Free crochet pattern.